Every so often we are, if you even know about it, consulted by Glasgow City Council, about what we want in our public parks. At the last consultation I don’t remember the public agreeing that we should have much more in the way of lock-out festivals and expensive, ticketed, gigs, taking up great swathes of our park space over the summer period when we need the park most. The problem with these consultations is is that they just seem like exercises in get consensus to allow more commercialisation of the park. The problem is as we see it is. The public do not just need consulted in these matters, we need to be involved in the discussion that leads to decisions. And to be involved in the discussion we need also to be aware of all of the facts relating to not only to the decisions made in our behalf, but also the longer term impact that these decisions will have on our green space. The value of parks needs to be equated by more than the shallow monetary value put on them and the superficial business orientated consultations which add up to the same thing. The city administration and public need to start taking these thing seriously and understand the real value that is attached to our city parks. The vistas and sense of space as a release from manic traffic. A space to exist as a family unit. Reduces friction, stress and family break-ups. Escape from city stress that leads to crime and violence. Autonomous space equality for everybody. Last bastion of space for the poorest in our communities. The park belongs to no one and to everyone. Look at just one element of our parks, trees. Trees absorb and block noise and reduce glare. A well placed tree can reduce noise by as much as 40 percent. Fallen tree leaves can reduce soil temperature and soil moisture loss. Decaying leaves promote soil microorganism and provide nutrients for tree growth. Trees help settle out and trap dust, pollen and smoke from the air. The dust level in the air can be as much as 75 percent lower on the sheltered side of the tree compared to the windward side. Trees absorb carbon dioxide and potentially harmful gasses, such as sulphur dioxide, carbon monoxide, from the air and release oxygen. One large tree can supply a day’s supply of oxygen for four people. A healthy tree can store 13 pounds of carbon each year – for an acre of trees that equals to 2.6 tons of carbon dioxide. Each gallon of gasoline burned produces almost 20 pounds of carbon dioxide. Trees help reduce surface water run-off from storms, thus decreasing soil erosion and the accumulation of sediments in streams. They increase ground water recharge and reduce the number of potentially harmful chemicals transported to our streams. An acre of trees absorb enough carbon dioxide in a year to equal the amount produced when you drive a car 26,000 miles. Readers of City Strolls will have been listening to this over the last ten years. “The parks are in the process of being privatised” The problem is what citizens are unaware of the business developments that have been been happening over that time, untill they see the barriers going up around their park. 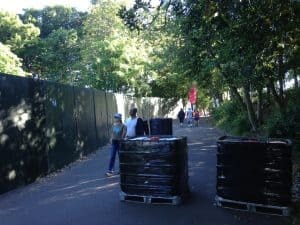 Recently Edinburgh city council deemed the hoardings closing off the view of Princess street gardens for a concert as being inappropriate. The hoardings in question were removed within an hour of the councils edict. Maybe the start of resistance to the kind of pay per view being enforced on the access of public spaces. Something we have seen increasingly across Glasgow parks and common spaces. With little or no objections that we are hearing about, from the administrators of our commons, parks and particularly in the lack of stewardship of our Common Good Fund. Why are we constantly asked in consultations. “What do we need in our parks?” Most would answer “Access to our culture and heritage, toilets and a few parkies” But the questions are really designed by each preceding city administration to fulfil their own need through our parks. i.e. the quickest way to emptying our wallets to generate commercial profits. And Strategies for better stewardship of parks and green spaces to reverse the commercial decline. How to work towards a long term vision for our green space that serves users and can supersede decisions on park use made by short term administrations who may not have the public’s and park users best interests at heart. 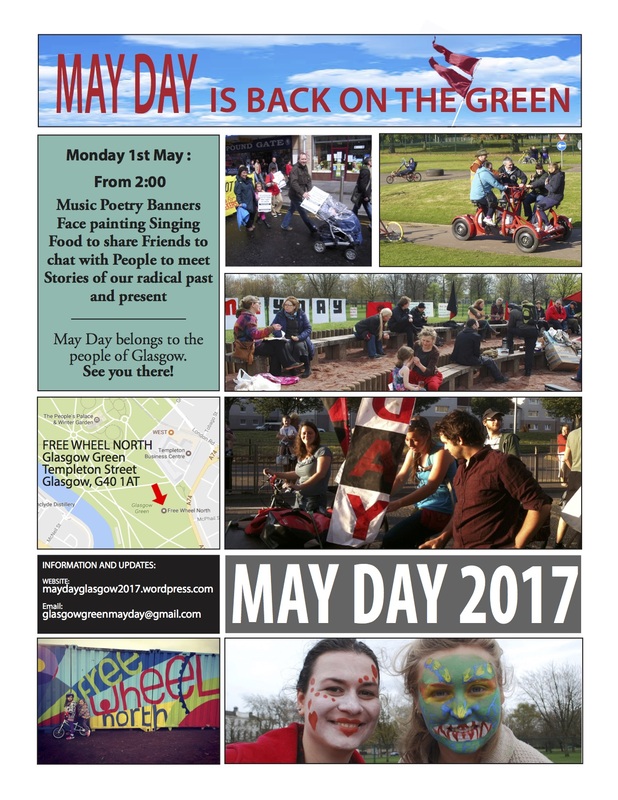 This article relates to an event to be held in Kinning Park Complex at “Parks for people” How to become involved in the discussion and understanding the importance of green space in our lives, economically, physiologically, health wise, environmentally, politically, historically and creatively. Times and Speakers to be confirmed. If you want to help out contact or join list. out in the open where it belongs. friendly afternoon. May Day belongs to the people, and belongs outside. The term activist is a bit odd as it implies everybody else is inactive, which is far from the case. But for this we will imagine an activist as someone engaged in public life, in political life, is interested in things outside of the private. Should that not be everybody? Is there such a thing as inactivism? After all, to do nothing has as big an impact on things as whatever else happens. Today maybe more than ever. So what is meant by activist, or activism, here is a marker to describe those odd people, to varying extents, that have some kind of political obsession. I guess what is meant by politics here needs some clarification to. Politics, in this sense, is what we do together; by discussing things, coming up with ideas consensually, by inclusion and by keeping as many people happy as possible, before making final decisions and acting on them. Politics is the act of engaging in public life. This description for the purposes here, should not be confused with “party politics”, which is something completely different. So what is activism here, in terms of what has being described above? Well specifically, activities towards implementing ideas that will force institutional change. The banking institutions; corporate institutions, state institutions and the powerful conglomerates, who for profit, ensure that many live in poverty. This is the high end of what needs to be achieved. If we can understand a bit about what is going on up there, we can understand what we need to do down here. This is the bit, apart from the obsessed, where peoples eyes start to glaze over. Attempting to explain to folk who are politically disengaged for many reasons, what is going on up there, in the corporate stratosphere . All they can see is the mad rush of their lives flashing past. All the things they need to do, or would rather think about, apart from, (to them) the abstract and intimidating world of the “activist”. What’s this got to do with me? A question constantly posed and rarely answered. The general problem with the activist, (self included) is that they usually know a lot more about what is going on up there, than they do about what is going on down here. This isn’t a criticism of the need for better understanding, more a question of context, more a question of what is needed at this point in time. 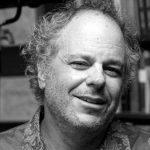 The question is not only about getting folk away from the television, consumerism and private life into public life, into the community, but also about getting the activist away from academia, social media, esoteric groups, the protest culture and the constant defense of their own righteous position, into the same community. We all need to have things we enjoy doing and that interests us. The point is. If that is all that we are doing, no matter how important we feel it is, we also need to ask. Who, and what purpose is it serving? In other words we are making much progress in cultural change and around social issues. There are a mass of wonderful things going on. But there are two things. Where is the infrastructure work growing out of this progress that will be powerful enough to challenge institutional power, i.e. the banks? Where is the work going on to engage the many ordinary folk we will need to raise to that challenge? In the world of the activist, we can usually fill rooms to listen to and watch how others, in other countries build and raise the kind of awareness and solidarity needed to challenge corporate power. Which is ok in itself. But in our own communities the same handful of folk will turn up when the problem is our own social housing, or such like, that is at stake. Sure there is commendable stuff going on on the ground and much to admire that we should be thankful for. But it is enough to shift the might of the powerful? To hurt as Michael Albert says, what they hold dear? That will take a massive mind shift in the population, but will still have more to do with practicalities than philosophy. A bit less peer to peering on the network and a bit more education to where it is needed most. By us getting out more, by showing up, by being active, in all the right places. The following offers some ideas for going forward. Yet again not much is mentioned of building grass roots networks that relate to peoples day to day lives. Maybe that could be part of a shared program? Resistencia: The Fight for the Aguan Valley from Makila, Coop on Vimeo. Some months back I interviewed Glenn Greenwald to appear on both ZNet and New Left Project – just as this article is appearing on both. The interview was substantive instead of an interviewer attacking and Greenwald parrying. The goal was for it to spur constructive discussion about journalism and the First Look project and Intercept component of it. It didn’t happen. 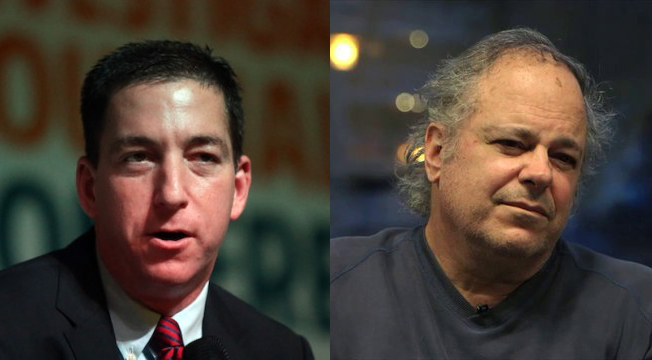 Greenwald is as quick, succinct, and clear in conversation as he appears in videos. He stuck me as likeable and certainly not the harsh fellow he is often made out to be. But some of his interview answers were troubling. Greenwald understands the coercive possibilities of capitalist owners or the state curtailing adversarial journalism from above. That is the danger Greenwald believes will not overtake First Look/Intercept because he feels the owner, Pierre Omidyar, is sincerely committed to never imposing restrictions and, more positively, to actively establishing a journalism-friendly workplace. “Workers City; the subversive past”. 45 mins duration. A documentary chronicling some ideas around radical Scottish working class history. Farquhar McLay, poet, editor of “the Voices of Dissent” and “Workers City” anthology of prose and writing, subtitled the Real Glasgow Stands Up’. John Taylor Caldwell, archivist, biographer of Guy Aldred and author of “Come Dungeons Dark” recently published by Luath Press. James D. Young, historian and republican socialist, author of “The Rousing of the Scottish Working Class” and others. Recently working on major biography of Red Clydesider, John Maclean. Spirit of Revolt Archive Glasgow from City Strolls on Vimeo.